MEXICO CITY -- The monarch butterfly is now facing a potentially lethal threat to its over-wintering habitat in Mexico's oyamel fir forests. As if it weren't enough for the migratory butterfly to contend with illegal logging in the Monarch Butterfly Biosphere Reserve, it is also facing severe depletion of the milkweed, which is indispensable for its development from egg into butterfly, caused by ever-increasing use of herbicides on genetically engineered corn and soybean crops in the American corn belt. There was no prior consultation with affected groups, no public diffusion of information, no evaluation of the hydrologic impacts of the mine and no risk analysis. Extreme weather events, including drought and storms, and the unpredictable consequences of climate change are also taking their toll. Now, Grupo Mexico, Mexico's largest mining corporation, has been awarded a concession to reopen an old mine in Angangueo in the state of Michoacan, a town in the heart of the monarch reserve that was closed 25 years ago. The company intends to mine copper, zinc, lead, silver and gold. In April 2005, a subsidiary of Grupo Mexico filed an environmental impact assessment for the mining project with the Secretariat of Environment and Natural Resources, also known as SEMARNAT. Michoacan's secretary for urbanism and the environment declared that mining would have no impact on the monarch migration, and a former head of the monarch reserve insisted that development is compatible with conservation, that no one can prove monarch colonies over-wintered in the area when the mining concessions were granted at the end of the 19th century. The EIA was grossly inadequate. There was no prior consultation with affected groups, no public diffusion of information, no evaluation of the hydrologic impacts of the mine and no risk analysis or mention of risks for the human population. The EIA was only for a specific site and not regionally, as is required by law, since the reserve is part of the Lerma and Balsas Rivers watersheds and is defined as a priority hydrologic region. In order to extract the resources, mining will extract large volumes of water from the subsoil and expel it outside the area being worked -- but there is no mention in the EIA of the substantial impacts of this process. In 2010, heavy rains lead to disastrous flooding in Angangueo, destroying houses and taking lives. The mine tailings left behind when the mine closed magnified the damage. Residues of arsenic, bromine, lead, barium, cadmium, chrome and mercury have been found in Angangueo's water, and iron levels in the soil far exceed official norms. The EIA does not evaluate potential levels of toxicity from the production of sulfuric acid. The environmental impact assessment was grossly inadequate. A toxic spill in August 2014 at a Grupo Mexico copper mine in the northwestern state of Sonora was labelled by the head of SEMARNAT as the Mexican mining sector's worst environmental disaster in recent history. Nearly 11 million gallons of copper sulfate spewed into the Bacanuchi and Sonora Rivers. Hundreds of miles of waterways and the water supply for 24,000 people were contaminated with copper, arsenic, aluminum, cadmium, chromium, iron, manganese and lead. The National Water Commission blamed negligence on the part of the company, but Grupo Mexico falsely claimed the spill was caused by unexpected heavy rains that raised the level in a holding tank at the mine. It wasn't Grupo Mexico's only disaster. In February 2006, 65 workers were killed in an explosion at Grupo Mexico's Pasta de Conchos mine in the state of Coahuila. Sixty-three bodies still remain underground, and the Mexican Attorney General's office has stated that the statute of limitations for prosecuting those responsible has expired. Pasta de Conchos was run by Industrial Minera de México, the company that owns the Angangueo mine. In February, the governor of Michoacan met with Grupo Mexico representatives to discuss the benefits the mining project would generate, like creating jobs and increasing tourism. Angangueo's mayor has said that Industria Minera de Mexico is already at work in town. The reserve's management program allows for mining if all rules and regulations are complied with. However, as there is no precedent for exposing over-wintering monarch butterflies to a major mining operation, there are no studies to draw on, and so the EIA does not address the inevitable consequences to the butterflies. Water is vital for the monarch during its over-wintering in the reserve. If the mine is reopened, the impacts will become known but doubtless it will be too late for the monarchs. With satellite imagery and drone photographs, we documented the location and extent of illegal logging during 2015 in what should have been one of the most protected areas within the Monarch Butterfly Biosphere Reserve in Mexico. Severe logging of 10 hectares took place from April to August. This questions the effectiveness of current strategies to protect the already precarious overwintering habitat of the monarch butterfly in eastern North America. Curiously, the logging took place in a parcel of land belonging to the state of Michoacan, the only state-owned parcel in the entire reserve, and not in any of the neighboring communally owned ejidos. On March 10 and 11, heavy rain, wind and a severe snowstorm hit the reserve, knocking down trees and tearing off roofs in neighboring towns. 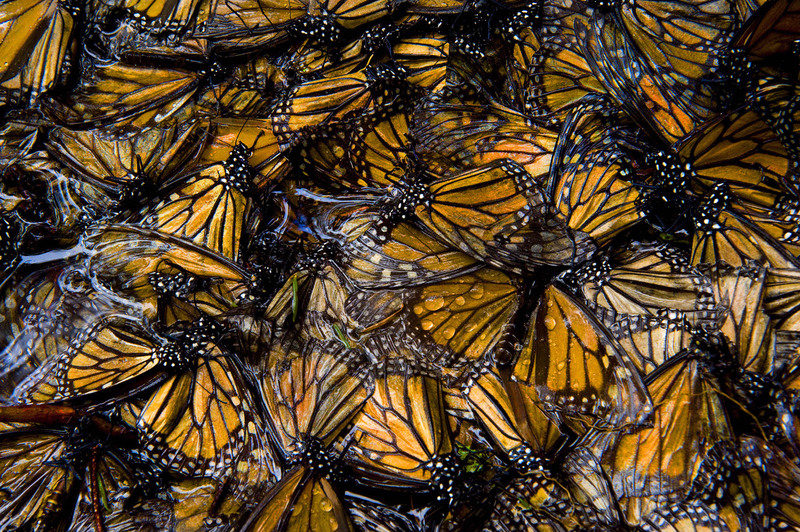 Officials were quick to deny any substantial harm to the monarchs. Preliminary studies by Brower and others point to a mortality rate as high as 50 percent. The investigation has been hampered by limited access to the affected areas, especially at El Rosario. A recent photo showing illegal and/or salvage logging near El Rosario by a local resident who wishes to remain anonymous. About a week after the storm a fire was deliberately set near the El Rosario site to put pressure on the reserve's acting director to authorize so-called salvage logging, presumably to remove trees after natural disturbances. Recent photos show that salvage logging has been taking place at the El Rosario site, where an alarming quantity of wood has been removed, with all the destructive impacts this process implies. There is no reliable way of telling which trees were "salvaged" and which were cut down illegally, as all the logging appears to have been done at once, a convenient scheme for tree laundering. There has also been salvage logging on Sierra Chincua. In March, the Center for Food Safety and the Center for Biological Diversity filed a lawsuit against the U.S. Fish and Wildlife Service, charging the agency with failing to protect monarch butterflies under the Endangered Species Act. A recent scientific study predicts that the migratory monarch could become extinct within the next 20 years, largely due to the herbicide-resistant, genetically engineered corn and soybeans that make up 90 percent of these crops grown in the United States. If the mine is reopened, the impacts will become known but doubtless it will be too late for the monarchs. 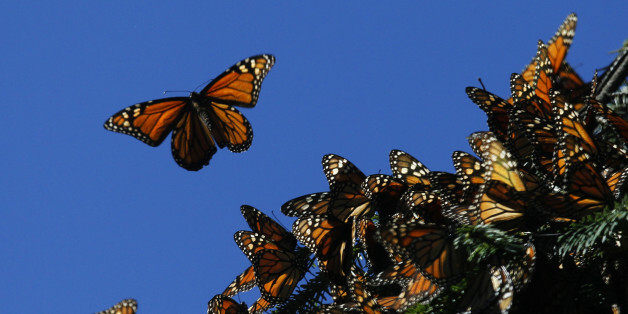 I grew up in Contepec, Michoacan, where millions of monarchs used to arrive every winter. But they no longer do. In 1986, I asked President Miguel de la Madrid to establish the Monarch Butterfly Special Biosphere Reserve, which he did. In 2008, as Mexico's ambassador to UNESCO, I convinced the 21 members of the World Heritage Committee to declare the reserve a World Heritage site. But now I fear that the extraordinary monarch butterfly migration may not withstand the combined onslaughts of extreme weather, milkweed-killing herbicide use, illegal logging, mining and corruption.